For Shyquinn Dix, going to college isn’t just about getting an education, it’s about having a life-changing experience. 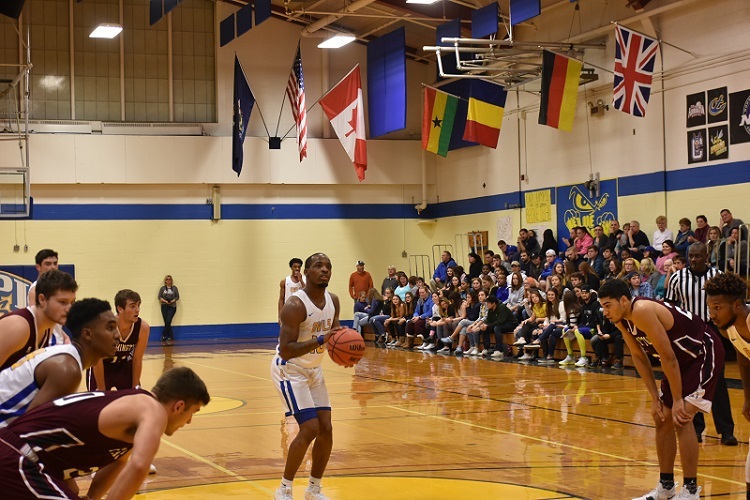 The University of Maine at Presque Isle sophomore, Social Work major, and point guard for the Owls basketball team was featured on 60 Minutes in late March because of his unusual journey from success to second chance. 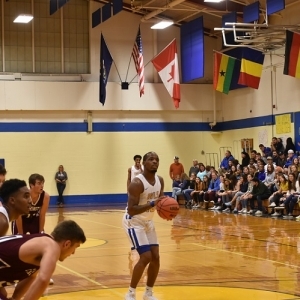 Best known by the nickname Shy, Dix grew up in Stamford, CT, and was a standout basketball player for Stamford Academy, receiving First-Team Westchester Independent Athletic Association honors while averaging 25 points, six rebounds, and six assists his senior season. He went on to lead his school to a WIAA championship and was named tournament MVP. When it came to his college decision, Dix opted to play for North Platte Community College in Nebraska, known nationally for its National Junior College Athletic Association basketball program. While he had a solid year on the court and in the classroom, his family commitments drew him back home to Stamford after his freshman year. Life back home wasn’t easy, though. He was out of college basketball for three years when he was charged as part of a check-fraud scheme and was sentenced to four years in prison. He served much of his time at Cheshire Correctional Institution in Connecticut. After spending about a year and a half in general population, he learned about the T.R.U.E. program. The prison program focuses on individual reform for 18-25-year-old offenders, providing them with older inmate mentors, life-skills classes, and much more positive interaction with correctional officers. While Dix wasn’t sure what the program was about, he was sold on the fact that participants could spend more time outside of their jail cells. It was in the program that he met James Vassar, one of the correctional officers in the T.R.U.E. unit. When Vassar finally got Dix to talk to him, he found out about his years playing basketball: “He found a picture of me when I was at North Platte and said, ‘If you want a second chance, take this program seriously,’” Dix remembered. That advice changed things for Dix. He began separating himself from others in the program that he felt weren’t taking it seriously. He became an active participant in discussions. And, once invested in the program, he, Vassar, and others started to look into the possibility for a sentence modification and for a college that might give him a chance. Eventually, they connected with UMPI basketball coach Dan Kane. After several phone calls and emails, Coach Kane paid a personal visit to Dix at Cheshire Correctional. Coach Kane said he knew right away that Dix would be a good fit for the team and for UMPI: “One of Shy’s mentors told me, ‘Everyone is going to be very sad when Shy leaves, because he’s that type of person that brightens up a tough situation and brings positive energy. But everyone’s going to be happy to see him leave, because he doesn’t belong here and he has a bright future ahead of him. If anyone can do it, he can do it.’ That really spoke to me,” he said. After his Connecticut visit, Coach Kane met with campus leadership and shared his experiences and his recommendation. College applicants with criminal records are reviewed on a case-by-case basis and must show how they are ready for the opportunity. Dix did, and with his UMPI acceptance in hand, and a solid plan for his future in place, a sentence modification followed soon after. He completed his celebratory signing to play for UMPI on Aug. 6, surrounded by members of the Boys and Girls Club in Stamford. And since then? Dix has been named a 1st Team All-Conference selection to the North Atlantic Conference as well as the Second Team All-State, and made the Fall 2018 Dean’s List. After he finishes out his first year at UMPI, Dix has plans to start a summer league back in Stamford and lead a program at a community center, teaching things he learned in the T.R.U.E. program. And someday, he hopes to start his own nonprofit—It Gets Greater Later. To learn more about the T.R.U.E. program, check out the Dispatches from T.R.U.E. blog posts at https://www.vera.org/blog/dispatches-from-t-r-u-e. To learn more about the 60 Minutes story, visit https://www.cbsnews.com/news/german-style-true-program-at-cheshire-correctional-institution-emphasizes-rehab-for-inmates-60-minutes/.